Let's start things off by going through some IDP news, notes, and commentary from Week 5 of the NFL season. Brad Jones limped off the field Sunday with an apparent hamstring injury. No updates have been given by the team yet, but it seems like the injury could cost Jones some games. Clay Matthews also fell victim to the injury bug (thumb) and is expected to miss 6-7 weeks. Wesley Woodyard left Sunday's tilt against the Cowboys with a neck injury and did not return. This is definitely a situation to monitor. Cameron Wake played just one series before re-aggravating his knee injury. The Dolphins have a bye this week so hopefully Wake can rest up and be ready to play come Week 7. As anticipated, Bruce Carter split time with Ernie Sims against the Broncos last week. Sims was pretty awful in every regard and I don't expect this timeshare to continue much longer. That said, it's probably best to keep Carter out of your lineups until we see him back to playing near 100% of the snaps. Daryl Washington silenced any concerns about his LB1 fantasy status with a monster performance (8 solo tackles, an assist, 2 sacks, and an interception) in his first week back from suspension. He's locked in as a stud LB1 moving forward. The Raiders have seemed to switch almost exclusively to a 3-4 defensive scheme. Lamarr Houston and Kevin Burnett seem to be the biggest beneficiaries. Bobby Wagner's struggles continued last week as he was only able to muster 1 solo tackle, giving him just 16 for the season. He was apparently playing through an ankle injury (which may keep him out next week, so watch that) but he has been underperforming since the start of the regular season. He's only safe to use as an LB3 right now as Seattle continues to limit their own tackle opportunities, but he's still worth rostering in most leagues and is a potential bounce back candidate. 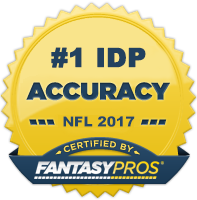 Now onto The Guru's IDP waiver wire selections for Week 6! LDE Shea McClellin (CHI) - McClellin is coming off his best game of the season in which he produced a 4-2-0 stat line. The Bears have been devastated by injury along the interior of their defensive line which as forced Corey Wootton inside and freed up McClellin to receive a majority (94%) of the snaps on the outside. He's likely available in most leagues and is worth a speculative roster add as DL4 with DL3 upside in deep leagues. RDE Ropati Pitoitua (TEN) - Pitoitua (no idea how to pronounce) has done an admirable job filling in for bust Kamerion Wimbley. He's had 3 solos in four of the five games this season and 3 sacks in his last two games. Seattle's offensive line is leakier than you may expect so look to Ropati as a solid DL4 option in deeper leagues in Week 6. DE/OLB Bruce Irvin (SEA) - Irvin is really only worth adding if he's designated as a DL in your league. If so, consider him a sneaky DL3 add as he's a good bet for a sack every other game or so. However, don't expect much in the way of tackle production as Irvin will see the majority of his snaps in obvious passing situations. SILB A.J. Hawk (GB) - There haven't been any updates on Brad Jones' injury yet, but based on the past troubles with his hamstring and the Packers' radio silence, I have the feeling it's a multi-week injury. That said, A.J. Hawk becomes an every down linebacker. Although he struggles in coverage, he's been a productive fantasy player on a per snap basis. With little competition around him for tackles and a very nice matchup this week against the Ravens, Hawk becomes one of the top waiver wire pickups of the week. Consider him a high floor LB3 with LB2 upside until Jones comes back. ILB Brandon Spikes (NE) - The season-ending injury to big man Vince Wilfork has had a ripple effect on the Patriots' defensive scheme as they used quite a bit more 3-4 looks last week (27) than the previous week (4). Additionally, Brandon Spikes was back in subpackages (he played 83% of the total snaps) as the Patriots used Spikes on a handful of run blitzes throughout the game. The increased snaps led to 12 total tackles for the 4th year veteran and has his overall value trending upward again. The Patriots play the spread offense of the Saints this week, so Spikes remains a risky play as there's still a chance he misses a good amount of snaps. Nonetheless, it's a situation to keep a close eye on in shallow and moderate-sized leagues and he's a serious stash consideration in deeper leagues. MLB Moise Fokou (TEN) - By all means, Fokou is an underwhelming talent. However, in recent weeks he's been the only every down linebacker on a team that receives it's fair share of tackle opportunity. Add in the great matchup against Marshawn Lynch and the Seahawks and you have a nice bye week/injury filler LB3 for Week 6. RDE/SLB Shaun Phillips (DEN) - For those in big play leagues who have already missed the boat on the likes of Robert Mathis, Terrell Suggs, and Justin Houston, Phillips is a nice consolation price. He has 5.5 sacks so far on the year and has a fantastic matchup against the Jaguars who have given up 4 sacks a game and a total of 36 QB hits. Start with confidence in leagues that reward heavily for sacks. SS Devin McCourty (NE) - If there has been a fairly clear IDP rule over the last couple seasons, it's start safeties who are playing against Drew Brees and the Saints that particular week. Through the first five games of the season, there has only been one starting safety that HASN'T put up more than 5 solo tackles against them. McCourty is coming off 6-3 and 8-4 stat lines in the last two weeks respectively and will be shadowing Jimmy Graham for a majority of the day making him a superb waiver wire pickup this week. He's a fairly good bet for 7-9 tackles this week. Steven Gregory is also worth a look in deeper leagues. S Will Hill (NYG) - Hill returned from his four game suspension with a bang as he mopped up an impressive 11 solo tackles and was seemingly all over the field. He is still the third safety behind Ryan Mundy and Antrel Rolle but played in 100% of the team's snaps with the Giants using their Big Nickel package (i.e. 3 safety package) in an attempt to slow down the Eagles spread offense. That said, there is some inherent risk with picking up Hill and starting him moving forward. Defensive Coordinator Perry Fewell his hinted that the scheme will remain similar in future weeks, but there's a chance things change when Terrell Thomas returns from injury. All in all, Hill is worth a pickup as a DB4 or DB3 if you are struggling to fill the spot, as there is very little tackle competition from the front seven in New York and Hill could therefore could continue to put up big numbers if given enough snaps. LCB Josh Robinson (MIN) - Robinson is currently tied for the league led in solo tackles by a cornerback with 28 with only four games played. The matchup against the Panthers is an admittedly poor one as no CB has put up more than 4 solo tackles yet this season against them, but Robinson is worth getting on your roster in CB-required leagues and even in standard leagues as a DB3/4 until he shows that the first four weeks were a fluke. FS Reed Doughty (WAS) - Fantasy owners have had an on and off again relationship with Doughty over the last couple of seasons as he seems to bounce in and out of the starting lineup. With rookie Baccari Rambo's recent benching, Doughty is once again getting the chance to start and, per usual, he's putting up respectable fantasy numbers. He's not going to win you any leagues, but he's a good bet for 5-6 solos and a couple assists in most weeks while he is starting.